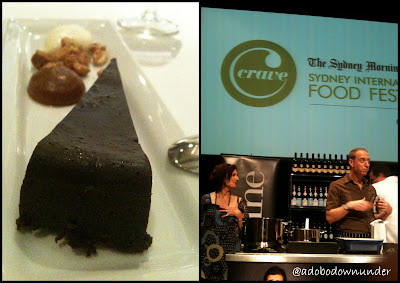 I was a happy camper at the Crave Sydney - World Chef Showcase at the Hilton Sydney over the weekend as part of the annual Sydney International Food Festival. Been waiting for this day for 4 months since I bought the tickets in June. 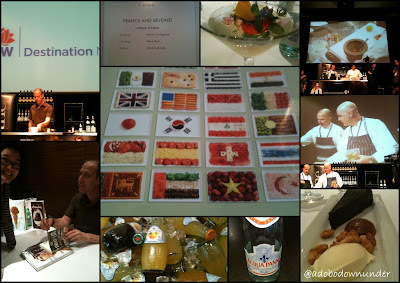 I was over the moon to meet in person my favourite pastry chef and food blogger David Lebovitz. He's such a charmer and took on the audience with his wit, humour and honesty! After quietly following his blog for years, it was quite an excitement to see him in person. The session France and beyond also showcased local chef Mark Best from Marque and French chef Mauro Colagreco who both surprised the audience with their creativity and exciting dishes. 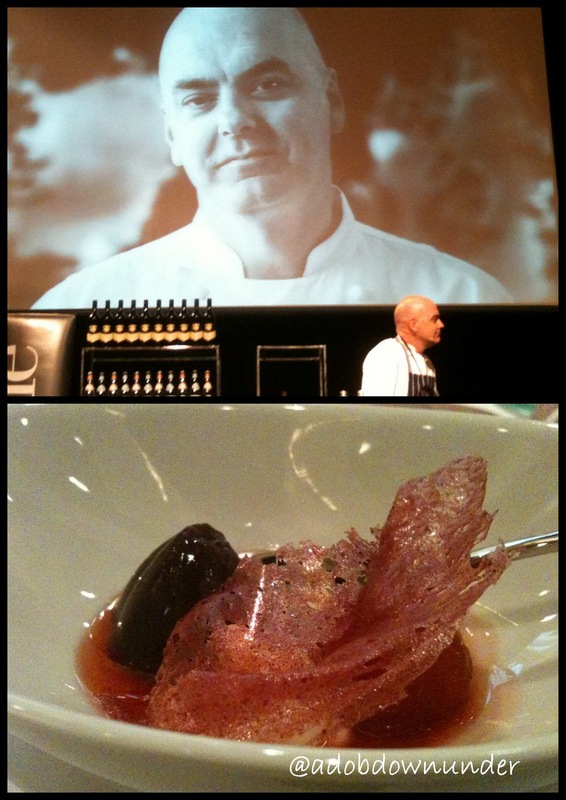 Chef Mauro prepared 3 different dishes all focusing on one ingredient - the versatile tomato! 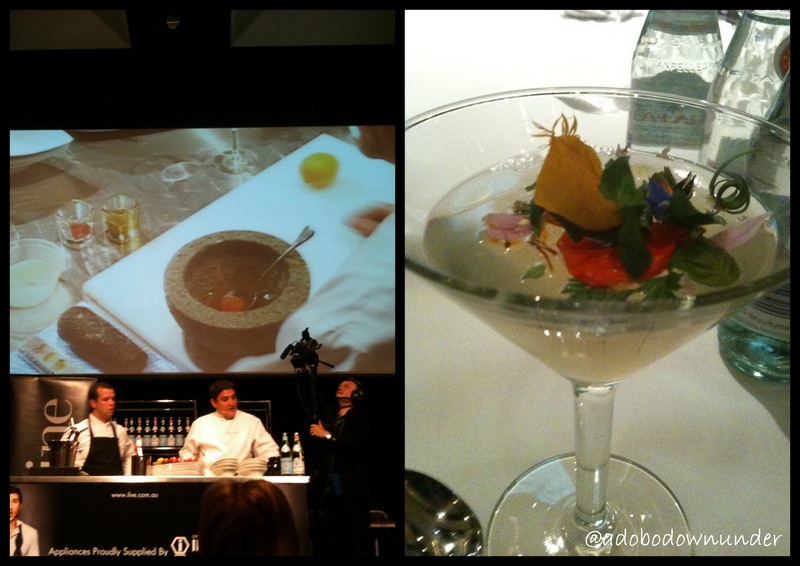 The tomato martini was a welcome surprise - a subtle hint of tomato in jelly form with sea salt flakes and an assortment of edible flowers and some leaves as garnish. It was an absolute treat to the senses. Chef Mark Best's Tomberry dessert was another mouth-watering gastronomic explosion with the combination of strawberry-flavoured tomato, light chocolate jelly and the raspberry tuile. David's chocolate orbit cake was a welcome treat with the dark and dense chocolate cake accompanied by salted caramel and the nuts! The audience loved the peanuts so much, they kept asking for more! Overall, a great foodie event which was worth the anticipation! While it was all too overwhelming seeing so many celebrity chefs, food writers and other foodie enthusiasts, it was a great day to be around people who have the passion for food and cooking! I'm looking forward to being a part of another Crave Sydney tonight - the opening of the Shoot the Chef exhibit at the Chifley Plaza! What an exciting month October is!